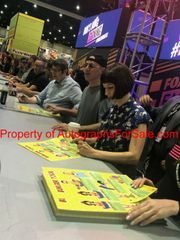 Roughly 11 by 17 inch mini promo poster for the hit TV show Bob's Burgers autographed in black marker by executive producer Loren Bouchard and ALL 7 main cast members including H. Jon Benjamin, Dan Mintz, Eugene Mirman, John Roberts, Kristen Schaal, Larry Murphy and David Herman for a total of 8 autographs. This is the FIRST Bob's Burgers signing with this many cast members. Obtained in person at extremely limited 2018 San Diego Comic-Con signing. With certificate of authenticity from AutographsForSale.com and photo from the signing. Signatures and locations will vary slightly as we obtained multiple posters from this signing.